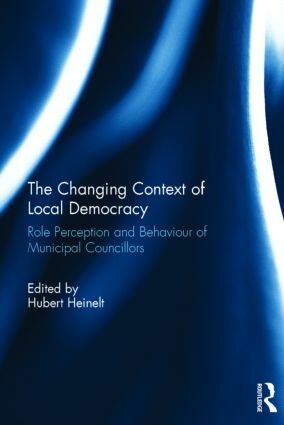 This book reflects on the role and task perception as well as the behaviour of councillors in the changing context of local democracy. Political leadership at the local level has attracted growing attention in recent years in parallel with reforms of local government and of the municipal administration as well as the debate on a shift from government to governance. But this debate is mainly focused on single leaders, i.e. mayors or executive officers. Considering the power triangle of (i) the mayor, (ii) the municipal administration (executive officers) and (iii) the council, it is surprising that councillors have gained little interest so far. The chapters start from a common conceptual framework. They start from the hypothesis that the role perception as well as the behaviour of councillors cannot be conceived of being determined directly by (i) both formal and informal institutional structures as well as by (ii) personal characteristics. Instead, this collection argues that the perceptions and behaviour of councillors are depending on their notion of democracy. Whilst the understanding of democracy can be affected by institutional structures, it also depends on the personal characteristics of the councillors. This book was published as a special issue of Local Government Studies. Hubert Heinelt is Professor of Public Administration, Public Policy and Urban Studies at the Institute of Political Science, Technische Universität Darmstadt, Germany. From 2010 to 2013 he was the President of the European Urban Research Association (EURA). His research focuses on public policy (in the EU multi-level system) and urban studies.